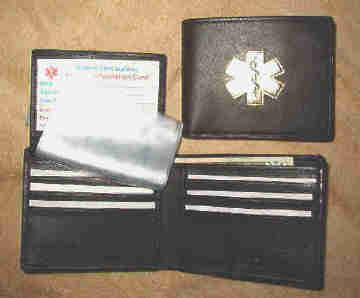 The Bi-fold flip ID black leather Medical Wallet are hand crafted for Medical Alert Wallets only. 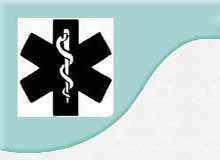 This black bi-fold flip ID Medical Wallet are made from genuine black leather and dark brown. To add style to this bi-fold flip ID black leather Medical Wallet we had the Medical symbol Gold colored Hot Stamped on the outside. Inside these Bi-fold flip ID black leather Medical wallets there are 6 clear credit card slots, 6 leather credit card slots, 2 pockets, one on each side under the leather slots, 2 full length currency holders, one with a suede backing, 1 hide a key holder and a Medical Information Card, for you to fill out.